It must be difficult for nonscientists to appreciate the scientific evidence. In an interesting paper that was published yesterday in the Proceedings of the National Academy of Sciences, the authors support their earlier work by showing that extremely rare but exceptionally disruptive de novo mutations (mutations that arise during the development of either the sperm or egg that combine to form the individual) account for about HALF of autism cases. The authors noted that many of these mutations occur in genes that are expressed long before birth—and before vaccination. The authors also note that the ASD risk from transmission of mutations from a parent (usually this involves transmission by the mother of a mutation in her own genome, since females are “protected” against ASD and are therefore more able to transmit it to their offspring) roughly equals the risk from de novo mutations. Issosifov I et al. Low load for disruptive mutations in autism genes and their biased Transmission. PNAS; published ahead of print. September 23, 2015. Well, there is one way that vaccines relate to autism. If a child died of a vaccine communicable disease, the child could never have his or her autism diagnosed. I’ll even add that there is one vaccine in rather uncommon usage that is extremely dangerous. The only reason it was ever used in the first place was the approximately 1/3 morbidity and mortality rate from the disease it protected against. Vaccinia, the smallpox vaccine. The reason it’s fallen out of common usage is because smallpox is extinct in the wild, with only a sparse few research centers retaining viral samples. The only people to receive that vaccine are public health workers who travel to developing nations, giving protection against camelpox and monkeypox and the military, who may face weaponized smallpox. But, that is just being a wise guy, while still remaining entirely factual. But, in all of the comment, nary a notion of harm actually occurring from any vaccine, other than smallpox vaccine. For the truth is, being vaccinated means not contracting a vaccine preventable disease and well, nobody would’ve bothered making a vaccine against one of those diseases if deaths and disability did not occur from those diseases. Oh, folks, it’s cooling off and soon, we’ll all be indoors for the winter. Wash your hands. Then, wash them again. Norovirus is already making the rounds, which for a healthy person makes for a bad few days, for the young and elderly, it can be lethal. Influenza will also be making the rounds soon, so keep washing those hands and get the flu shot. It isn’t the most effective vaccine, but it beats absolutely no protection at all. Oh, did I mention wash your hands? Over the last two decades extensive research has asked whether there is any link between childhood vaccines and autism. Scientific research has shown there is no relationship between autism and vaccines. Vaccines are very important. Parents must make the decision to vaccinate their children. Efforts must be continually made to educate parents about vaccine safety. If parents decide not to vaccinate they must be aware of the consequences in their community and their local schools, as well as possible legal issues due to that decision. 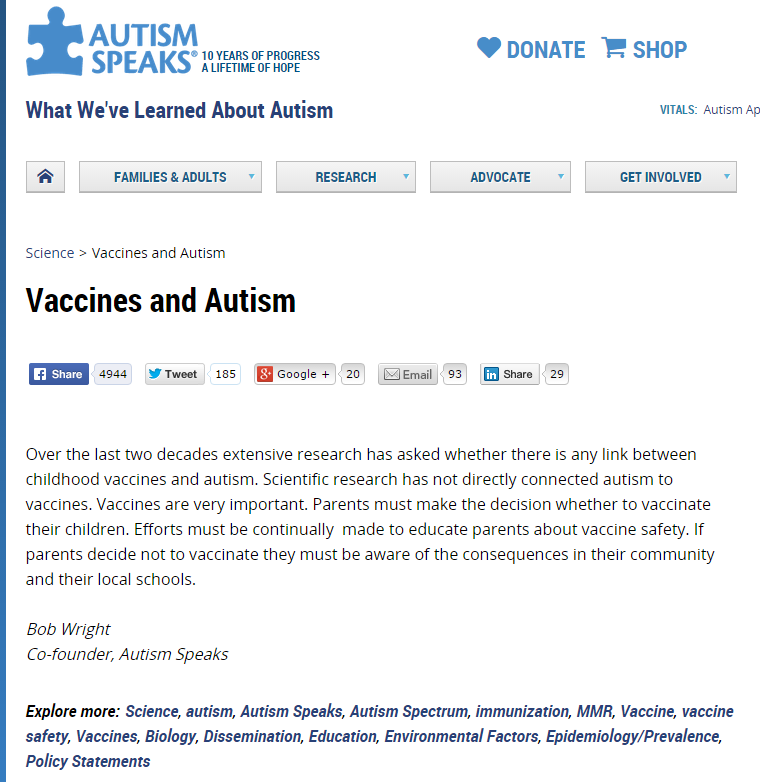 Bob Wright and Autism Speaks have expunged the statement by their science officer. Disgraceful. That’s all I have to say. I think it’s basically the same story as with James MacNeil, who you will recall essentially ended a distinguished career with a sleazy and evasive program about vaccines. Like him, Bob Wright has a daughter who fell under the spell of the charlatan Wakefield, and an autistic grandchild. So, if either man wants to sustain a relationship with a grandchild, they’d better keep it sweet with the intermediate family member. It’s probably the most serious conflict of interest possible in this area of science, but it’s hard to formulate. I think you mean Robert MacNeil. It was a bad ending to an excellent career. MacNeil gave a platform, lending his name and credibility, to ideas and people who didn’t deserve it. This page is still on the Autism Speaks web site. Autism Speaks position about many things,not only vaccines,has been very confusing to say they least.As an organization,they seem to want to take all sides of every issue.You cannot do that,and maintain credibility.One can’t help but wonder what sort of conflicts have going on behind the scenes at Autism Speaks over the issue of vaccines.Is Rob Ring still working for Autism Speaks? In an ideal world,Autism Speaks would use both its prominence,and at least some of the large corporate donations it gets to promote both the fact vaccines are safe,and childhood disease prevention,but there are those on the board of AS who would never allow this.I would LOVE to see AS reach out to someone like Dr. Richard Pan or Dr. Paul Offit and offer them a place on their board,but we know that isn’t likely to happen. I’m hesitant to point this out because I do not want to take the chance that it was a oversight which they will correct as a result of my comment, but the original statement can still be found on their FAQ page. Under the “Are vaccines to blame?” heading, the original, unequivocal wording can be found. With all the millions of dollars raised by Autism Speaks – much of it from families of modest means and a stake in autism – it saddens me to see how little the Wrights opinions seem to have changed despite all that money, and all the research and advertisements and executives it bought. I sure do feel like I wasted my time. I spoke with a researcher who was in on some of your meetings. Said researcher made it very clear to me that you had a positive impact.